In light of the recent Yik Yak and AEPi incidents involving acts of intolerance on campus, Emory University’s Black Student Alliance (BSA), Emory Hillel and Indian Cultural Exchange (ICE) collaborated in hosting the “United We Stand: Hillel, Black Student Alliance and Indian Cultural Exchange Solidarity” event on Wednesday, Oct. 29. BSA Vice President and College senior Kimberly Herard said the overall goal of the event was for the Emory community to “stand together.” The event took place at the Marcus Hillel Center and consisted of two interactive activities followed by refreshments. The first activity was a “privilege walk” during which all 25 students in attendance stood in a line side-by-side with their eyes closed. One of the leaders of the event presented scenarios involving intolerance. Individuals who felt the scenario applied to them stepped forward and acknowledge being touched by such prejudice. These scenarios involved phrases, such as “your community has been portrayed by the media in a negative way,” and attempted to show that individuals of different identities can face similar problems with regard to intolerance. This activity was followed by a text messaging activity in which each person was given the opportunity to respond anonymously via text to various questions involving how they feel their community is treated on campus. Questions included “Do you feel that acts against certain communities at Emory are valued more than others?” and “Where is a place you feel accepted on campus?” The goal of this activity, according to the event leaders, was to alleviate the pressure of judgment that comes with having an opinion that is different than the norm of a given community. Finally, as a symbolic gesture of unity, the leaders of BSA, Hillel and ICE invited all attendees to make a paint handprint on a poster displaying the words “United We Stand.” After, all participants were invited to engage in conversation over refreshments, share their thoughts on the event and discuss what can be accomplished to eradicate intolerance in the near future. Attendees such as College sophomore Noam Kantor went on to say that a major hindrance in engaging in solidarity acts is not knowing individuals in a community that you may not identify with. Not knowing these people leads to a lack of support among groups that might be dealing with similar difficulties involving intolerance. Kantor continued by saying that events like “United We Stand” aid in creating relationships with individuals of other communities, which leads to their ability to stand by each other. Kantor went on to mention that he would definitely take part in future events like “United We Stand” and that he felt that this event aided in starting to build bridged among people coming from different cultures. 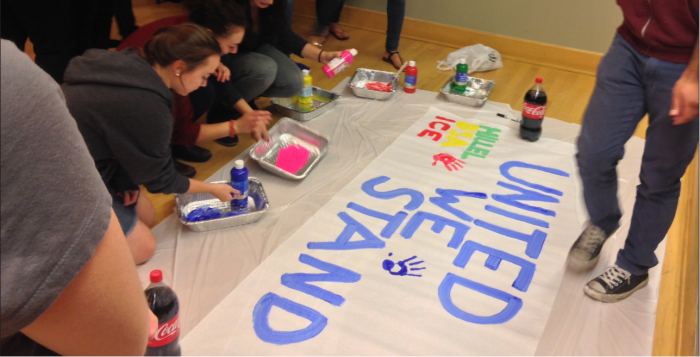 As for joint multicultural group events, “United We Stand” is just one of many to come. BSA, Hillel and ICE all have plans to engage in many more in the future. ICE Co-President and College junior Armaan Nathani remarked that a future large-scale event that would bring these groups together again would be ideal. Nathani also went on to note that discussions like the one that took place at “United We Stand” are helpful but that they can only take full effect when the individuals that engage in these conversations take action. “Projects like TableTalk Emory are a great first step towards addressing these issues,” Nathani added. “Many students are unaware when specific groups with which they do not identify have an act of intolerance committed against them,” ICE Co-President and College junior Adit Gadh noted during the discussion portion. Gadh is motivated to advocate awareness of these acts through future events. As to the impact that “United We Stand” had on its attendees and hosts, Hillel Co-President and College senior Eddye Golden said that seeing members of the Emory population come out to support one another makes her very proud, not only in regard to the groups that participated in the event, but to the Emory community as a whole.